Food Security and Agriculture are very much back on the agenda. Building on its Food Security Thematic Strategy Paper 2007-2010, the European Commission is currently developing a new Policy Framework to assist developing countries addressing agriculture and food security challenges. 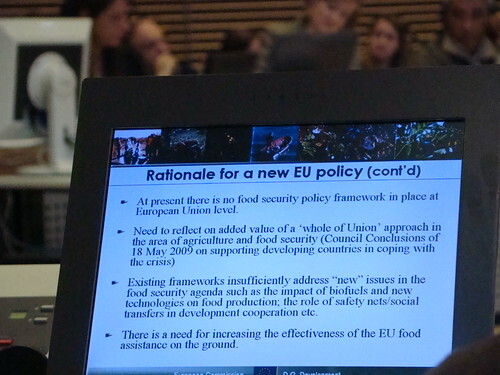 On 9 december 2009, at the CTA organized Brussels Briefing “From Global Food Crisis to Local Food Insecurity”, the Directorate General for Development elaborated on its Issues Paper on food security. The Issues Paper was published 16 november 2009 and is part of the consultation and policy development process which has to lead to Council Conclusions – an official statement of the ministers of EU members states – on a Policy Framework on Agriculture and Food Security in May 2010. Several participants at the Brussels Briefing organised by CTA commented on the presentation by the DG-Development representative. ActionAid welcomes the EC initiative but feels the Commission has no long term approach to investment in agriculture and food security. Also, according to ActionAid, the EC approach lacks attention for women’s access to credit, land and services. For example, compared to an earlier version, the chapter on agriculture has been removed from the current version of the EC Gender Action plan, a document stakeholders may comment on next week. ActionAid also warns about the so-called “whole of union approach” that the Commision wishes to explore in connection with issues of Food Security. This approach suggests that members states – besides official development cooperation - use all kinds of other resources to achieve development objectives. However, ActionAid and Concord are concerned that the "whole of the union" approach is more about “counting all resources” as opposed to really “using all resources”.